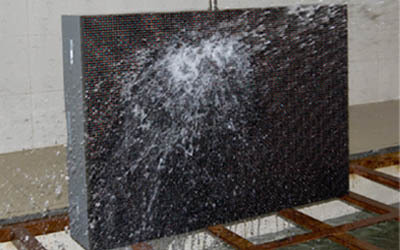 The most important features of outdoor LED display is waterproof and dustproof. When the rainy weather comes, heavy rain and hot weather are repeated. The LED display lamp beads are MSD components (humidity sensitive devices), damp weather on the led display is a big challenge. When the rainy season comes, how to protect the outdoor LED display from moisture and waterproofness? First of all, to choose a high degree of protection of the product, usually in the IP65 above for the protection level. Outdoor led display is in a complex compared to the indoor display. Not only to consider the wet problems, but also to do waterproof and other rain maintenance work, especially in some rainy seasons and regions. For sultry sauna climate, it is high temperature and huge humidity, resulting in easy expansion of the device deformation; In some areas, the coastal climate for the salt fog, typhoon, fog and other bad weather, high temperature and humidity; Greet the rainy season, high temperature, humidity, small wind speed, lack of light, easy to get moldy. If the screen body is dropped with water, how to deal with it? A, the brightness (all white) should be adjusted to 10%, powering on and testing for 8-12 hours. B, the brightness (all white) should be adjusted to 30%, powering on and testing for 12 hours. C, the brightness (all white) should be adjusted to 60%, powering on and testing for 12-24 hours. D, the brightness (all white) should be adjusted to 80%, powering on and testing for 12-24 hours. E, the brightness (all white) should be adjusted to 100%, powering on and testing for 8-12 hours. 1, do not put the watered led display screen into the flight case/box, it is very easy to break the LED lamps. 2, in the warehouse when the water, the air box may have to water, and should be all the flight case to the sun, to prevent moisture in the case after the container to the inside of the volatile. 3, if all the watered led display cabinets can not be dealt with quickly, it will more or less affect the stability of the screen body. In the emergency process, dead lamps may occur when the screen is powered on. 4, if all the watered led display screen body is in the flight case for more than 72 hours, the screen body is basically no value for repair. Please be careful. In addition, whether it is indoor screen or outdoor screen, to avoid the destruction of the screen function of the most effective way is often used, the working state of the display itself will produce some heat, can some of the steam evaporated, so greatly reduced Dampness causes the possibility of short circuit. Therefore, the often used display screen, relatively less commonly used display humidity is much smaller. CHINA LED PRO suggests that in the rainy and humid season LED screen display for at least once a week, at least once a month to open the screen once, and run it up for more than 2 hours. Using results and lifetime of a good product can not be separated from careful maintenance. To remind you that the use of products in the rainy season must pay attention to the product when the waterproof and moisture-proof situation happens, and also beware of damage caused by the screen due to moisture and fire.